If you haven’t noticed, you probably haven’t been up to the ski area, but the Crested Butte Mountain Sports Team (CBMST) is in full force once again this year, as evidenced by the throngs of young ripping athletes in bright green coats. The program continues to grow each and every year. While last season was a banner one with 160 participants in a variety of programs, this year the CBMST is up to 180 young athletes ages seven to 18 years old. Programs include alpine racing, freeride, telemark and snowboarding and are anywhere from one day a week on the mountain to five days a week. It hasn’t always been that way. Back in the 2008-2009 season the CBMST program was born and while numbers were low at the start, and slim for a number of years, it has gained traction, support and interest over the past 10 years. Conor Lynch returns to head the alpine race program. 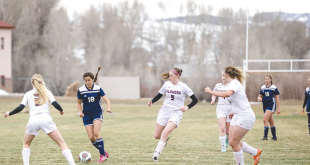 Lynch started coaching in the valley with the Crested Butte Academy and joined the CBMST staff in 2008. Since then he has been able to foster the fledgling program through its lean years and now has 32 athletes committed to training and traveling for races. “It’s grown tremendously,” says Lynch. This year he has three coaches helping out, with Katie Davidson returning as an assistant and Lynch, Graham Holland and Laura Brooks helping with the younger ages. One point of pride is the number of racers the CBMST will have at the Prater Cup this season. The Prater Cup is a USSA U14 qualifier event that draws more than 200 of the top Colorado ski racers to Crested Butte. In past years, local racer participation has been slim. This year, eight CBMST skiers will be defending their home hill, the most since Lynch has been coaching in the valley. Lynch credits the growth of the race program to a number of things, primarily the consensus among all CBMST coaches and staff. “All of us came to a common philosophy that it all comes down to having a race background,” says Lynch. Whether it means staying on the path of ski racing or moving into the big mountain freeride realm, the techniques learned racing or training for racing makes athletes stronger skiers. They’ve also seen some success with two skiers named to the Rocky Mountain Division team last spring and another on the cusp this year, including an invitation to a speed camp at Copper Mountain. “We’re starting to see some success and the younger kids see that and want to be a part of it,” says Lynch. To provide for that success, the CBMST and the ski resort have worked closely to maintain areas for kids to train skiing through gates. Typically, they set up on Buckley under the West Wall lift. But with low snow, the resort and CBMST have been able to find other areas for the program to get critical hours of training by roping off the sides of runs and setting up gates. “The mountain has always worked well with us and it’s been crucial getting the kids skiing gates,” says Lynch. The CBMST had their first early morning session on Wednesday when they loaded the lift at 7 a.m. to ski a giant slalom course on International. All of this is geared toward a plan Lynch and the CBMST have in place for the young athletes. Ultimately Lynch hopes to build an International Ski Federation team of CBMST athletes. Skiers that not only race at a higher level stateside but also travel overseas to compete. “I’m excited, I think we’re going to start seeing more and more results,” says Lynch. The alpine race team kicked off their season with some races in Vail, December 16-17 and then will hit the road in full force in January with 12 kids at the U14 age class and older going to Loveland for races, January 3-4 and 16 kids at U14 and below going to Loveland, January 6-7 for more races. Meanwhile, the freeride team has been doing the best they can to prepare for the upcoming junior big mountain competition circuit. Will Dujardin returns to the helm as head coach of the freeride team. Mark Robbins continues his work with the telemark freeride team as well as the alpine skiers, and Grant Spear, Matt Evans and Emma Patterson are all back as well, making for a seasoned staff of coaches, several of whom once competed for the CBMST. Last year the team had 26 athletes, 10 of whom qualified for the Junior National Championships. Three of those 10 won the overall title in their age groups. “I feel like we’ve been pretty successful,” says Dujardin. This year Dujardin and his staff have more than 35 athletes signed up and while snowfall has been lacking, and thus terrain limited, it hasn’t slowed them down one bit. Despite the low snow, the energy remains high on the freeride team. “With 10 kids making championships last year, that has given us a lot of energy going into this season,” says Dujardin. 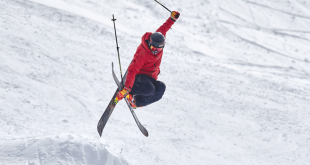 Unfortunately, the freeride competition season has already suffered the result of low snow as events in Snowbird and Telluride have already been rescheduled for later in the year. The hope is that things change, since the first event of the season in Crested Butte is a little over a month away. In the end, Lindenmeyr credits a lot of the CBMST growth to a commitment to coaching and fine-tuning the overall CBMST program. “I think through hiring good coaches and getting them trained and adding in a little more organization it’s become a rich program,” says Lindenmeyr.